Arby wasn’t sure what to do. When we let them outside in our garden, they munch on the small bits of grass that grow between our flower patches and between the bricks in the garden. We thought they would start grazing when we took them out of their carriers and set them on the grass, but they weren’t really interested in the grass. Alex took off running and preferred to walk on the pavement. Arby didn’t seem to know what to do. After a while he started to follow Alex and all of us were trotting around. 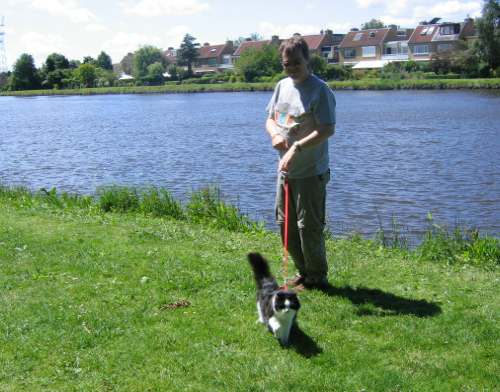 This entry was posted on Saturday, June 28th, 2008 at 11:28 am CET and is filed under Personal, Websites & Tools	with tags arby & alex, cats, netherlands, Personal. You can follow any responses to this entry through the RSS 2.0 feed. You can leave a response, or trackback from your own site. 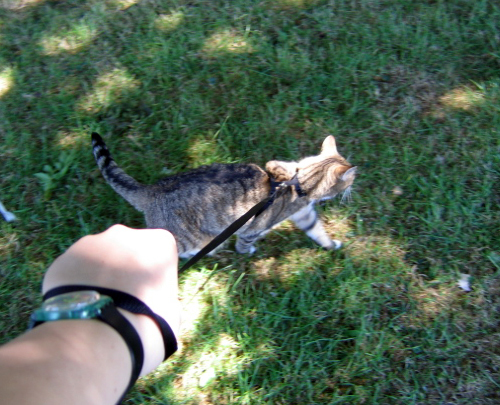 Too cute – my kitties have harnesses too – for emergencies. Neither of mine are much interested in “walking”.